Wondering what could save the small, rural economy, he opened the town’s first second-hand bookshop in the old fire station, and took “the strongest men of Hay” to America, where libraries were closing fast. They bought and shipped books in containers back to Hay-on-Wye and were responsible for an economic boom. Following Booth’s success, nearly forty independent bookstores opened in the small town, and it now draws in an estimate of 350, 000 visitors a year. Renowned as the first ever “town of books”, Hay was famous enough to take its love of books to the next level. In 1988, the Hay-On-Wye Literary Festival was birthed, and today draws in around 80, 000 visitors over ten days, whilst its sister festival How The Light Gets In draws in an added 35, 000. In 2005, Booth sold his beloved bookstore and declared he was moving to Germany. Booth never did move and still lives in Brynmelyn. He opened another bookstore, though, appropriately named The King of Hay. But that is another store which I need very little excuse to visit soon. 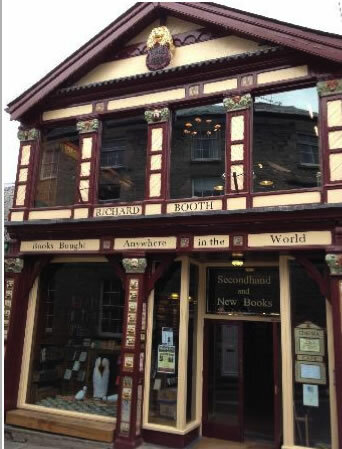 For now, let us concentrate on the glory that is still named after its king, Richard Booth’s Bookshop. A sophisticated blend of burgundy and cream, Booth’s Bookshop towers over you. But with an almost “thatch-like” roof, it is not intimidating. Three floors tall and long enough for the end to not be in view, you are filled with neatly stacked books from floor to ceiling. But unlike many “book caves” (which, don’t get me wrong, are wonderful) you are not short on space. 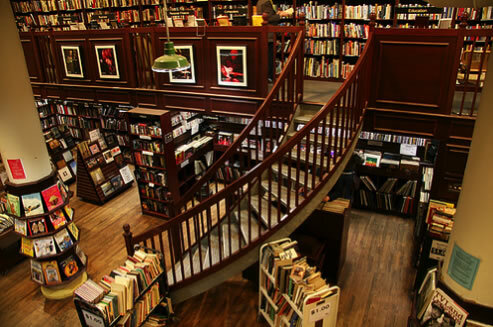 Plenty of room to roam around and explore, the store is handily split into sections with clear signs hanging overhead or on the ends of book isles. Booth’s aims to please, and there isn’t a genre left uncovered here; Fiction, Children’s Literature, Young Adult, Biography, Gardening, Food, Art, Architecture, War and History, Wales, etc. etc. I would be shocked if you couldn’t find what you were looking for, and I have it on good authority that if the store is missing something, they’ll order it in for you. My favourite section of the store is upstairs, where there is a space dedicated to The Folio Society. At the end of the Fiction isle and over-looking the hustle and bustle of the street below, we are met with a lovely literary display of bookish ornaments on a mahogany table, whilst two bookcases from floor to ceiling hold The Folio Society books- one case each end of the room. In the middle of these and close to the windows are armchairs which you are free to lounge on. Surrounded by some of the finest minds and accompanied with beautiful artwork, this is a tough spot to beat. This sounds pretty perfect, right? But wait- there’s more! The store also has a small cinema AND café. Yes really. Now I must admit, time hasn’t allowed me to attend the cinema yet, but the café is divine. It’s not the cheapest, but that’s because you are paying for quality. The menu, all made from organic produce, can even be found on the website. Y’know, just in case you want to give your tummy something to look forward to.